«According to the research of this image, we find that the donor Hieronymus Ambrosius Langenmantel, priest and canon law doctor from (1666-1709) of St. Peter am Perlach, had ordered this painting for a family altar, for personal reasons linked to his family. In the history of this true story, the noble Wolfgang Langenmantel married to Sophie Imoff (1612) and on the verge of a divorce, pays a visit to Jakob Rem J.P. in a monastery and university of Ingolstadt, located seventy kilometers north of Augsburg. A total of “four” visits were made to this priest in a lapse of “28 days” in where he received advice from this venerable Jesuit priest, a priest already honored for his wisdom, piety, extraordinary intelligence and known for having a Marian apparition in where he compliments Our Lady with the title of “Thrice admirable” ( Mater Ter Admirabilis). The noble was able to achieve changes in his family situation, as the result of prayer and the veneration of the Virgin Mary and in the company of the wise priest. Consequently on September 28th 1615 and the last day of their prayer, father Rem had been praying before an image of the Virgin Mary under the title of ( Our Lady of the Snows) located in the chapel of the monastery. “In a solemn ritual act”, Father Rem elevates the wedding ribbon untying the knots one by one and smoothing the ribbon out (1), causing the white ribbon to become such an intense bright, that not even the palette of any painter could have reproduced. With this experience the couple was able to avoid a divorce and their marriage was able to continue. Hieronymus and his grandson decide to donate a family altar, in commemoration of the turn of the century of the year 1700 as was the tradition in St. Peter am Perlach. The Altar piece was dedicated to “The Blessed Virgins of Good Counsel”, in it, is the story of his own family. The painter, Johann Melchior Georg Schmittdner, depicts the painting as a Virgin Mary who is “untying” the knots of the ribbon of married life, as the worried noble Wolfgang, walks towards the monastery accompanied by the Archangel Raphael. 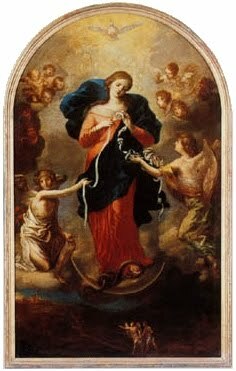 President Founder International Fraternity of the “Virgin Mary Untier of Knots”. Nada obsta a la Fe y Moral católicas para su publicación. Revdo. Mons. JOSE LUIS DUHOURQCensor Puede imprimirse. deliver us from the chains and confusion that restrain us. brothers and sisters. Mother of Good Counsel pray for us. We begin with our daily prayers, making the Sign of the Cross and praying the Act of Contrition so that God will enter our hearts, and he will brings us near to the Virgin Mary. of the Son, and of the Holy Spirit. sin. His Mother, first disciple and coore-demptrix, will untied our knots. ¡ Mater Ter Admirabilis ! overshadow you. Therefore the child to be born will be called holy, the Son of God. Mother of the Good Counsel ! « Mary said, “ Behold, I am the handmaid of the Lord. May it be done to me according to your word. Mater Ter Admirabilis ! ((Mother Three Times Admirable!) Mother of Good Counsel !, Mother of Divine Grace. Church, and with her to Jesus. Little by little, the knots of error that make us prisoners will be untied. Mater Ter Admirabilis ! (Mother Three Times Admirable!) Help of All Christians. Mater Ter Admirabilis ! (Mother Three Times Admirable!) Door to Heaven, Consolation of the Afflicted. Mater Ter Admirabilis ! (Mother Three Times Admirable!) Mother of Divine Grace. promise of his Resurrec-tion. From the darkness the light will shine to illumine us, freedom from darkness. Lamb of God that takes away the sins of the world. 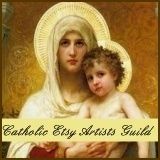 At this time we are closer to his Mother, the Virgin Mary. Mater Ter Admirabilis ! (Mother Three Times Admirable!) Mother of Christ. grant us freedom through her intercesión, she will untie the final knots that make us prisoners. Mater Ter Admirabilis ! (Mother Three Times Admirable! ), Mother of Christ, Help of All Christians. lies at her feet, made into a useless knot, unable to touch us. Mater Ter Admirabilis ! (Mother Three Times Admirable!) Mother of Christ, Help of All Christians.